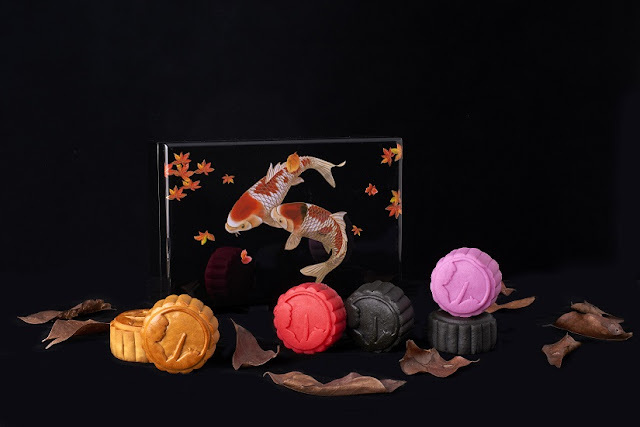 Six different Japanese-style flavours set Nobu Kuala Lumpur's Mid-Autumn mooncake selection apart from the crowded arena this year. Word has it the confection is flying off the shelves so make haste and grab yourself a box or two in time for the festival this October. We were told last year's lacquer boxes were a runaway bestseller and Nobu KL looks set to repeat the same feat this year. The attractive lure reeling in customers is the classy black lacquered box adorned with a pair of frolicking koi (Japanese carps to denote auspiciousness) with fluttering autumn maple leaves on the lid. Inside each box is a set of six baked mooncakes. Priced at RM148 nett, Set A consists of Mochi Skin Shiso Mooncake with Lotus Paste, Mochi Skin Shiso with Miso Yolk and Pandan Paste, Baked Charcoal Bamboo Mooncake with Black Goma Paste, Baked Green Tea Paste Mooncake, Baked Azuki Bean Paste Mooncake and Baked Fruits & Nuts Mooncake. Set B (RM168 nett) proffers 2 x Mochi Skin Shiso Mooncake with Lotus Paste, 2 x Mochi Skin Shiso with Miso Yolk and Pandan Paste and 2 x Baked Fruits & Nuts Mooncakes. Out of the whole repertoire, I personally am partial to the pink skinned, sweet-savoury tasting Mochi Skin Shiso with Miso Yolk and Pandan Paste. True to Nobu's Japanese-Peruvian approach, the red skinned mooncake with lotus paste incorporated flecks of shiso leaf and pumpkin seeds in it; tempering the filling's sweetness with the natural lemony freshness of shiso. Rich and toasty with nutty overtone makes the Baked Charcoal Bamboo Mooncake with Black Goma Paste agreeable although not particularly outstanding. We reckon the mildly bitter and astringent green tea version is a good choice to balance the richer offering. Even the Adzuki Bean Paste Mooncake boasts more pronounced 'beany' flavour compared to regular red bean paste. For the older generation who's nuts about dense mooncake filling, the Baked Fruits & Nuts variant should leave quite over the moon. Nobu KL patrons will also find two house variants which can only be sampled within the restaurant. One features a classic pairing of Green Tea & Red Bean in a chocolate shell mooncake while the other is an inventive combo of Miso & Chocolate Ice Cream Mooncake (RM50 each). 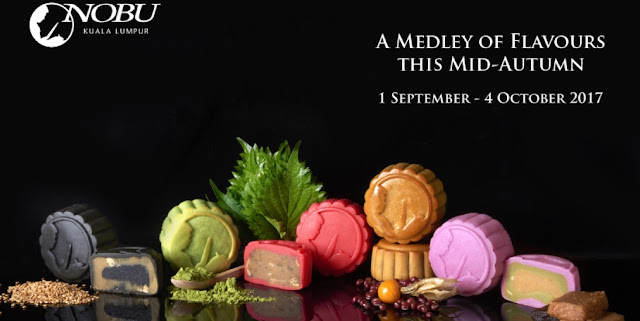 Nobu KL's medley of mooncakes are sold at Nobu KL restaurant, Level 56, Petronas Tower 3 and at the Mid-Autumn Festival kiosk at Pavilion KL, Level 1 (in front of Komugi) while stocks last. Call tel: 03-2164 5084 for more information.